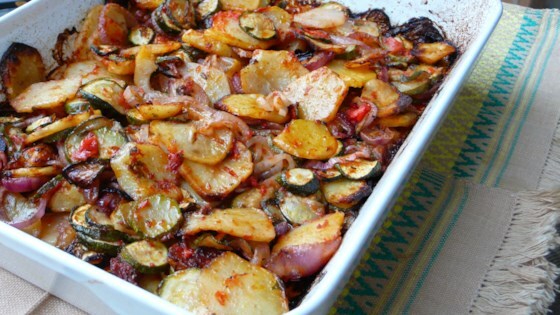 "Briam is a traditional Greek roasted vegetable dish with potatoes, zucchini, tomatoes, and red onions with lots of olive oil. It is a typical example of Greek cuisine where a few simple ingredients are turned into an utterly delicious dish with little effort. It can be served as a main course. With olive oil as the only source of fat it is a quintessential example of the Mediterranean diet, and it is vegan to boot. If preferred, serve with a hearty chunk of feta on the side." Spread potatoes, zucchini, and red onions in a 9x13-inch baking dish, or preferably a larger one. Use 2 baking dishes if necessary. Cover with pureed tomatoes, olive oil, parsley. Season with salt and freshly ground pepper. Toss all ingredients together so that the vegetables are evenly coated. Bake in the preheated oven, stirring after 1 hour, until vegetables are tender and moisture has evaporated, about 90 minutes. Cool slightly before serving, or serve at room temperature. Delicious, Greek vegan main dish! You can "puree" the tomato by cutting them in half and grating them on a large box grater, leaving the skin behind. This might seem like a lot of time in the oven, but trust me. The bulk of the flavor is derived from this, and you definitely want some nice crusty and charred edges on your vegetables for maximum flavor. Don't be afraid of salt and pepper with this dish. Be liberal for best results. Start out as you normally would, and you can always add more seasoning when you check after the 1-hour mark! If vegetables are too dry in step 3, add a few tablespoons hot water. There should be no water left in the end, however.